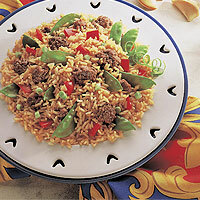 Pea pods add a nice crunch to this savory presentation of beef and vegetable fried rice. Brown ground beef with garlic and ginger in large nonstick skillet over medium heat 8 to 10 minutes or until beef is not pink, breaking beef up into 3/4-inch crumbles. Remove beef with slotted spoon. Pour off drippings. Heat 2 tablespoons water in same skillet over medium-high heat until hot. Add bell pepper and pea pods; cook 3 minutes or until pepper is crisp-tender, stirring occasionally. Stir in rice, soy sauce and sesame oil. Return beef to skillet; heat through. Stir in green onions.